Combines the original Inversion’s 100% Windstopper® shell with 60 Grams 3M™ Thinsulate™ Platinum Insulation. Gore® Windstopper® shell for ultimate wind protection. 60 Grams 3M™ Thinsulate™ Platinum Insulation. I bought a pair of inversion gloves and they are comfortable and block the wind great. I occasionally ride dual sport in the winter and needed something a little warmer. I bought a pair of the insulated inversions. I can now ride comfortably in near freezing conditions at 55mph. Works great so far, I may not need to install Grip Heater with this product. I did not use long enough to evaluate durability. Love these gloves. I've ridden all winter with them. Great wind blockers with enough insulation to keep you warm and still function. Great construction and materials. Typical Klim quality. Note there is no insulation on the grip side of the glove. 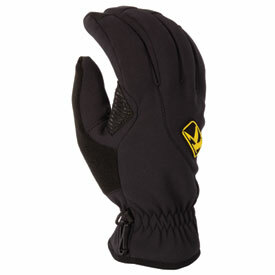 Which is fine but does effect the effective range of temperatures this glove is comfortable in without heated grips. Still without heated grips, works fine down to the low to mid 40s. I would liked to have seen more of a cuff or closure over the wrist. Also a little protection on the outside of the gloves would have been nice. While there is no a sizing chart here, Klim does have one on their site. Use it, and if on the edge I recommend moving up a size.